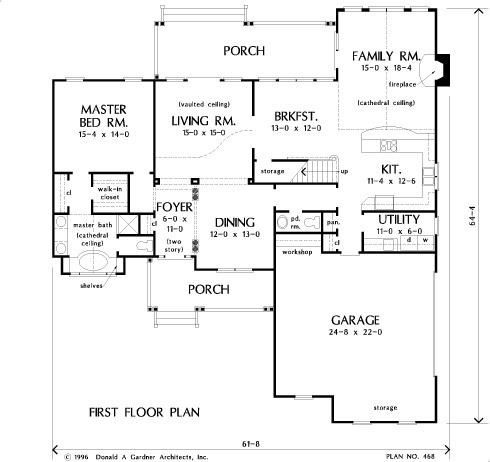 This four bedroom traditional plan offers comfortable family living space with well-placed formal areas for entertaining. The formal living and dining rooms are accentuated with stately columns and a dramatic balcony overlook, while the family room, open to the kitchen and breakfast area, sports a cathedral ceiling and fireplace making it a great relaxed family hangout at the rear of the house. 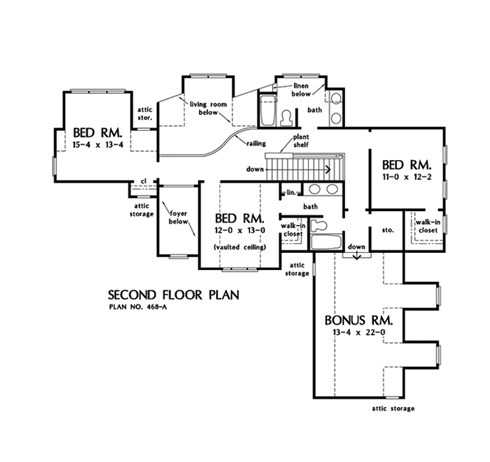 The private master suite occupies its own wing with every feature today's homeowners are seeking, such as ample closet space, dual vanities, and a beautiful garden tub with palladian window. Positioned for ultimate convenience, the stair leads to three bedrooms upstairs, one with its own bath â€” great for overnight guests. 1st Floor: 1847 Sq. Ft.
2nd Floor: 964 Sq. Ft. Bonus Room: 413 Sq. 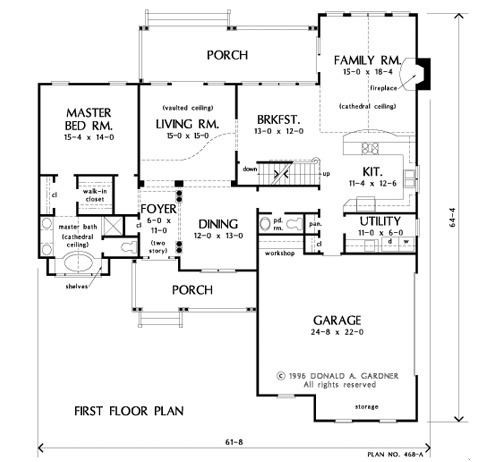 Ft.
House Dimensions: 61' 8" x 64' 4"
Great Room: 15' 0" x 18' 4"
Master Bedroom: 15' 4" x 14' 0"
Foyer (2 Story): 6' 0" x 11' 0" x 18' 1"
Dining Room : 12' 0" x 13' 0" x 9' 0"
Great Room (Cathedral): 15' 0" x 18' 4" x 16' 5"
Kitchen : 11' 4" x 12' 6" x 9' 0"
Breakfast Room : 13' 0" x 12' 0" x 9' 0"
Utility Room : 11' 0" x 6' 0" x 9' 0"
Bonus Room (Vaulted): 13' 4" x 22' 0" x 8' 10"
Garage : 24' 8" x 22' 0" x 0' 0"
Garage Storage : 15' 8" x 4' 0" x 0' 0"
Master Bedroom : 15' 4" x 14' 0" x 9' 0"
Bedroom #2 (Vaulted): 12' 0" x 13' 0" x 10' 6"
Bedroom #3 : 11' 0" x 12' 2" x 8' 0"
Bedroom #4 : 15' 4" x 13' 4" x 8' 0"
Porch - Front : 19' 7" x 6' 4" x 0' 0"
Porch - Rear : 28' 2" x 9' 0" x 0' 0"
Living Room (Vaulted): 15' 0" x 15' 0" x 18' 0"
Balcony : 15' 0" x 4' 0" x 8' 0"
Storage (1st Fl.) (Sloped): 9' 8" x 3' 4" x 0' 0"
Storage (2nd Fl.) : 4' 10" x 6' 0" x 0' 0"
Other : 7' 0" x 3' 0" x 0' 0"